You probably didn't hear me much in the second scene of Funky Friday, but I was there. Philip had put some tape over my mouth - which wasn't an all together unpleasant experience - to stop me complaining about my lost guitar, Marvin. Anyway, I was very interested in the contents of the Microfiche. One thing you might not of heard is that the Queen is actually immortal (both the leader of the commonwealth and the band, I think). 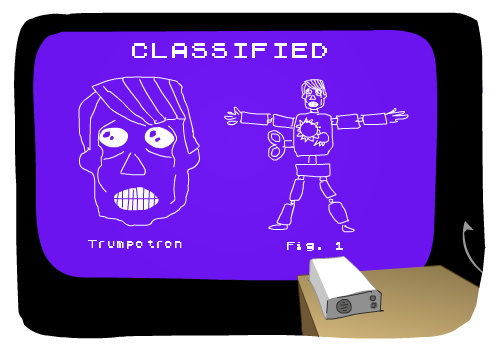 Another intriguing slide was the one that mentioned Trumpotron (See image below). I think Philip said it was something to do with a robot, but I didn't hear too well because Philip had tied a scarf around my ears. If you've got any ideas, please let me know. I would also love to know why Philip screamed at the end. Did he spill his coffee on his trousers? Finally, I would just like to say a farewell to my guitar tech, Romain in Paris, who sadly checked out this month. He looked after all my guitars, Betsy, Jimmy, Marvin, and the rest. He will be sadly missed. I'm drinking a whisky in a plastic cup for you, mate. Safe travels. Have a lovely month everyone.